Yesterday I spent my monthly allowance on a polyester shirt (yes, I said allowance – to manage our spending, my wife and I have monthly allowances). But this is no ordinary polyester shirt. Oh no. 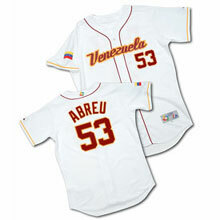 This shirt is the jersey for Team Venezuela in the World Baseball Classic. Emblazoned on the back of the jersey are the last name and number of Bobby Abreu, my favorite player. And so I’m in the store, wondering if I want to blow my entire month’s allowance only four days into the month, and wondering if I want to blow it on a polyester shirt. Well, let me try it on, I think. I put it on, and it looks pretty good. And then came the clincher. "You’re a baseball player," my 2 year old daughter said, and then she gave me a big hug. At that moment, I finally realized that it doesn’t really matter what anybody thinks. If my daughter says I’m a baseball player, then all is right with the world. You see, nothing could be farther from the truth (I was so bad at baseball that I retired from the Game in the fourth grade!). But this was probably the first time in my short tenure as a parent that I’ve experienced that DADDY IS THE BEST! kind of affection from my daughter. And wow, is that ever a special feeling! Of course, I know this won’t last long. Actually, it didn’t last long at all. All of a sudden the diaper bag became more interesting and daddy’s baseball player days were over . . . Oh well, it was fun while it lasted. And the shirt still looks great!